It is a cherished belief among Thai people that their country was never colonized. Yet politicians, scholars, and other media figures chronically inveigh against Western colonialism and the imperialist theft of Thai territory. Thai historians insist that the country adapted to the Western-dominated world order more successfully than other Southeast Asian kingdoms and celebrate their proud history of independence. But many Thai leaders view the West as a threat and portray Thailand as a victim. Clearly Thailand’s relationship with the West is ambivalent. The Lost Territories explores this conundrum by examining two important and contrasting strands of Thai historiography: the well-known Royal-Nationalist ideology, which celebrates Thailand’s long history of uninterrupted independence; and what the author terms “National Humiliation discourse,” its mirror image. Shane Strate examines the origins and consequences of National Humiliation discourse, showing how the modern Thai state has used the idea of national humiliation to sponsor a form of anti-Western nationalism. Unlike triumphalist Royal-Nationalist narratives, National Humiliation history depicts Thailand as a victim of Western imperialist bullying. Focusing on key themes such as extraterritoriality, trade imbalances, and territorial loss, National Humiliation history maintains that the West impeded Thailand’s development even while professing its support and cooperation. Although the state remains the hero in this narrative, it is a tragic heroism defined by suffering and foreign oppression. Through his insightful analysis of state and media sources, Strate demonstrates how Thai politicians have deployed National Humiliation imagery in support of ethnic chauvinism and military expansion. He shows how the discourse became the ideological foundation of Thailand’s irredentist strategy, the state’s anti-Catholic campaign, and its acceptance of pan-Asianism during World War II; and how the “state as victim” narrative has been used by politicians to redefine Thai identity and elevate the military into the role of national savior. 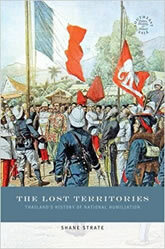 The Lost Territories will be of particular interest to historians and political scientists for the light it sheds on many episodes of Thai foreign policy, including the contemporary dispute over Preah Vihear. The book’s analysis of the manipulation of historical memory will interest academics exploring similar phenomena worldwide.